Fanf-Yi Sheu in Letter to the World, photo by Christopher Duggan. Fang-Yi Sheu is one of the finest Graham dancers of this generation. She is no longer a member of the Graham Company but often returns as guest artist. On 6th of August 2011 at the Gerald Ford Amphitheatre she performed the opening solo from Graham's Letter to the World, as reconstructed by the Company artistic director, Janet Eilber. Here is the link to the video recording done by Sergei Krasikof. It is a very precious video as it gives a glimpse of what the piece could look like today. The Graham Company has, in fact, not recosntructed and performed it since 1988 and the only video available to the public is in black and white at the New York Public Library for the Performing Arts, with a stunning Pearl Lang in the title role. This solo presents the main character as a lively and inexperienced girl in search of her path. She moves in different directions, runs, stops, moves again. 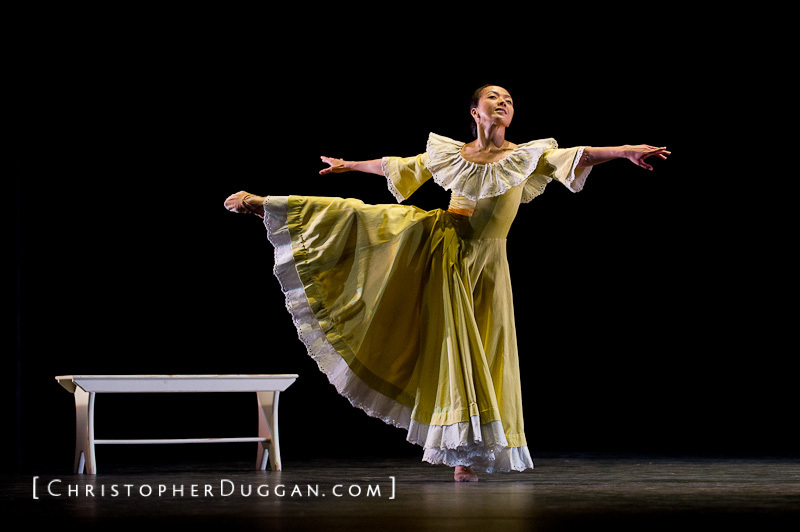 She performs some beautiful turning jumps that are highlighted by her wide skirt, bends her torso forward several times and dances a brief section at the bench (during the piece she will return to the bench in more than one occasion). It a real joy to be watching this section in colour (I have studied the black and white video for my research)! This readapted solo (there are variations and changes here and there) stands up as a nicely crafted choreographic piece and is very precisely danced by Fang-Yi Sheu, but, at the same time, we need to remember where it comes from. In the piece, the One Who Dances was with the One Who Speaks before beginning her solo. Her presence is only evoked through Dickinson's quoted lines: "Not knowing when the dawn will come, / I open every door", taken from poem 1619. The presence of the One Who Speaks is very important and instrumental to the developemnt of the piece. She is the other Emily, the speaking Emily, the one who moves more sedately but with equal force. And the lines are very important too. They convey the evolution of the main character's "inner journey", as Graham would say. I am very pleased about this little choreographic passage and hope Letter will soon be reconstructed in its entirety.